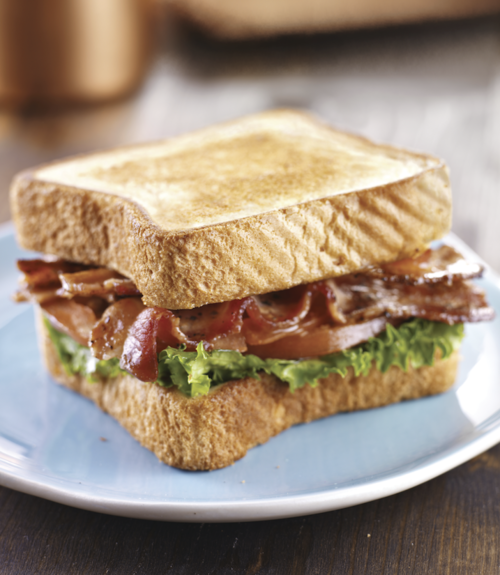 A classic sandwich that never goes out of style. Cook bacon according to package directions, drain on paper towels and set aside. Spread each slice with about 1 tablespoon of mayo. Place a 2 lettuce leaves on one slice of bread, repeat with second slice of bread. Place 3 slices of bacon on top of lettuce. Layer tomato slices on top of bacon. Sprinkle with salt and pepper. Place other slices of bread on top to make sandwich. Cut in half and serve.